In any business process, an obligatory component is the work with documents, which is automatically reflected in the article of printing costs. No matter how many printers are in your office, there are still these costs. Thus, it would be quite natural to try to save on this process. And it is best to do this without loss of quality and with minimal costs. The ideal solution in this case is the TM STARTPRINT cartridge. 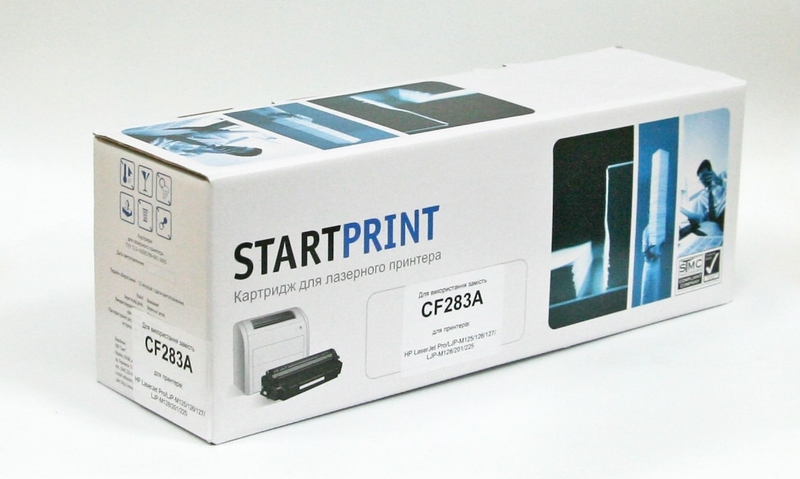 STARTPRINT cartridges are manufactured under the control of our quality department according to technical specifications (TU), where the technological processes are prescribed so that the product standards and the quality of the test print at the output are as close as possible to the original. Also, the quality of the STARTPRINT TM cartridges is confirmed by the received ISO 9001, ISO 14001 certificates and sanitary and epidemiological conclusion, which speaks about the safety of the products use and its safety for the environment. The advantage of the STARTPRINT cartridge is also the fact that the inside of the cartridge is equipped with parts with a multiple service life (in contrast to the original cartridge, when the manufacturer is interested in the drum and other parts having worked only one - the "original" cycle of their work and therefore makes them quality, but with a minimum service life). Thus, the cartridge TM StartPrint fulfills several cycles of refueling before it needs to be restored (with the obligatory replacement of the photoconductor and other components). In addition, the warranty for laser cartridges STARTPRINT is 12 months.